I'd like to thank all of the people who helped to build Phoenix, but I don't even know where to start. So I'll just say thank you to everyone who has done a thankless job. Everyone who has ever stood on hot asphalt so that people in air conditioned cars could complain about traffic going so slow, people who make sure that the cable service is uninterrupted, the electricity is on, and the water flows when we turn on the tap. I collect old photos of Phoenix and I am often amazed at what people have done to transform a desert into an oasis. The Arizona canal was dug, by hand, in 1885. Yes, they had a few mules to handle the real heavy stuff. Electric wires were installed by people who risked their lives to do so. Like I said, I could never list all of the thankless jobs. My interest in Phoenix history isn't about the stuff that they cover in school. I'm interested in learning about the people who do the ordinary living, and working. There are millions of them, and very few of them will ever hear an audience cheer when they show up for work. I know that it's fashionable to blame people for ruining everything. As if Phoenix would have been so much better without the canals, the roads, and the people who made it all happen. I disagree. And I may not be able to thank everyone who built my city, but I'm glad they did. Thank you. 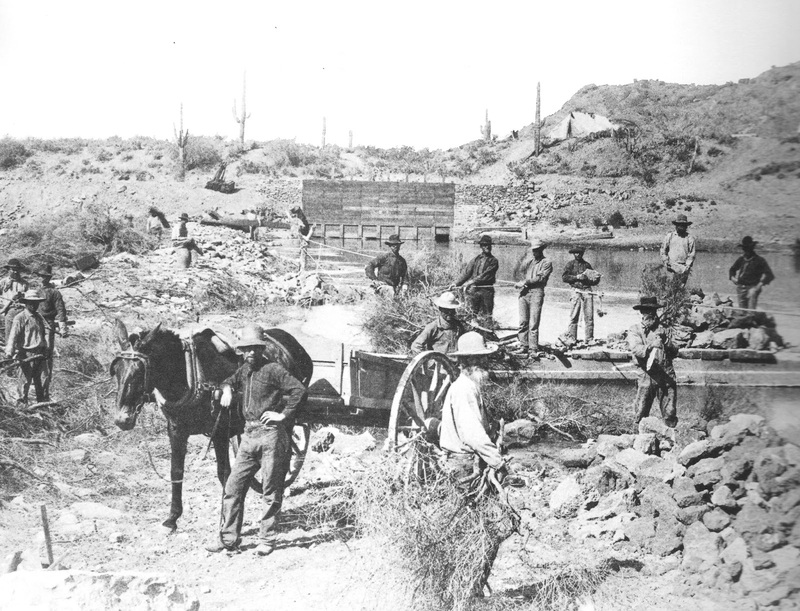 Image above: cleaning the Arizona Canal in the 1890s, Phoenix, Arizona. Thank you to my patrons on Patreon who help support History Adventuring! If you like these blog posts, and would like to make suggestions for future ones, please become a patron.